How could I live on Maui all these years without ever noticing this bus? 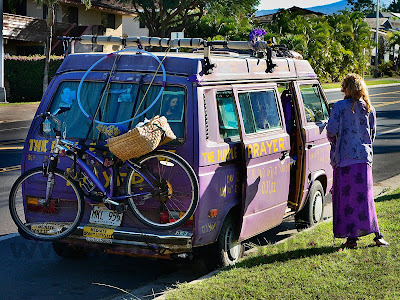 Purple interior, purple exterior, purple bike and purple clothing. I wonder what her favorite color is? BTW, no swim today, surf and murk levels are up, up and away. yup.. winter in Hawaii -0( Beautiful pic!